Griepen, Kaffeesäcke, Fässer, Ballen und Zuckerklatschen: Im Speicherstadtmuseum erleben Sie die einzigartige Atmosphäre der Speicherstadt. Im authentischen Rahmen eines Lagerhauses von 1888 wird veranschaulicht, wie die Quartiersleute (Lagerhalter) früher hochwertige Importgüter wie Kaffee, Kakao oder Kautschuk gelagert, bemustert und veredelt haben. Weitere zentrale Themen sind der Tee- und Kaffeehandel, der in den Kontoren der Speicherstadt ansässig war, sowie die Baugeschichte der Speicherstadt, die mit zahlreichen historischen Fotos und Plänen illustriert wird. DISCOVER HAMBURG'S WORLD CULTURAL HERITAGE! 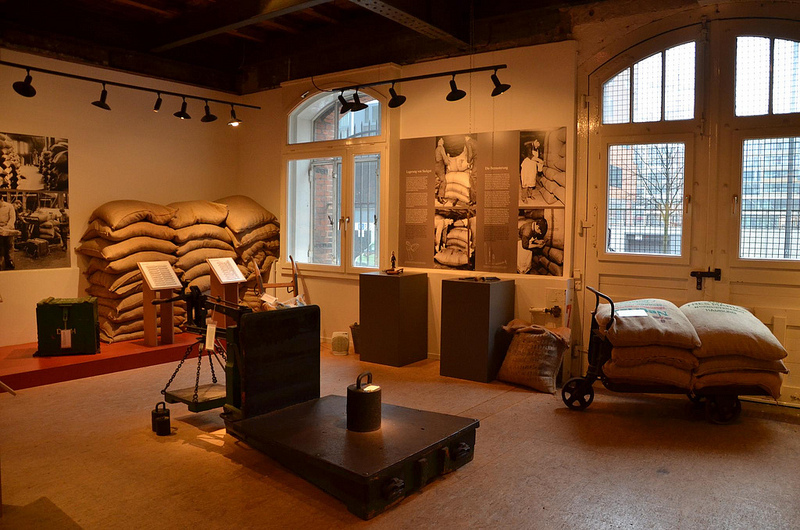 Grippers, bales of rubber, coffee-sacks, sampling implements, pure cocoa and spices: The Speicherstadtmuseum is located on an authentic floor of a redbrick warehouse that is over a hundred and twenty years old (from 1888) where typical goods and tools collected from traditional warehouse companies and business premises of the warehouse district are exhibited. Historical photos and maps illustrate the social and economic changes of over a century in this worldwide unique historical monument that used to be part of the former free-port and is now part of Hamburg’s UNESCO World Cultural Heritage. Further topics in the exhibition are: the architecture of the dockland warehouse district, coffee- and tea-trading as well as lighter-boating (supplying the warehouses with goods by transport on (cargo) barges). The “Speicherstadtmuseum” is a privately run branch of the “Museum der Arbeit” (Museum of Work).